Add in two cloves of minced garlic (about 2 tsp). Be careful not to brown it, just slightly heat it. 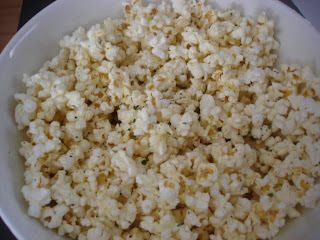 Empty popcorn into a large bowl and toss it evenly in the butter mixture, then toss in a few heaping spoonfuls of grated parmesan cheese. Mangia, e guarda il film! *Note: cayenne pepper or hot pepper flakes really spice this up! Or try adding lemon juice for a tangy twist!